"We live in a time of turmoil. Earthquakes and tsunamis wreak devastation, governments collapse, economic stresses are severe, the family is under attack, and divorce rates are rising. We have great cause for concern. But we do not need to let our fears displace our faith. We can combat those fears by strengthening our faith. "How you deal with life's trials is part of the development of your faith. Strength comes when you remember that you have a divine nature, an inheritance of infinite worth. The Lord has reminded you, your children, and your grandchildren that you are lawful heirs, that you have been reserved in heaven for your specific time and place to be born, to grow and become His standard bearers and covenant people. As you walk in the Lord's path of righteousness, you will be blessed to continue in His goodness and be a light and a savior unto His people (see D&C 86:8-11). "Available to each of you brethren and sisters are blessings obtained through the power of the holy Melchizedek Priesthood. These blessings can change the circumstances of your lives, in matters such as health, companionship of the Holy Ghost, personal relationships, and opportunities for the future. The power and authority of this priesthood holds the keys to all spiritual blessings of the Church (D&C 107:18). 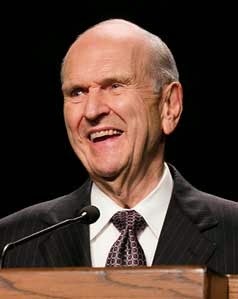 And most remarkably, the Lord has declared that He will sustain those blessings, according to His will (D&C 132:47, 59)." The world "turmoil" is a vivid and descriptive one. It conveys a sense of great uncertainty, disturbance, trouble, or confusion. 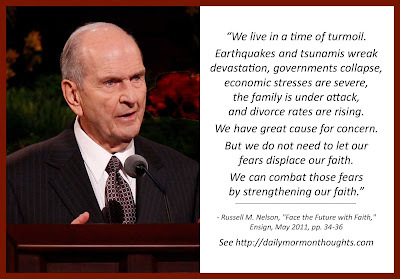 President Nelson lists examples of the kinds of situations, both natural and man-made, that can create those feelings of desperation. Instead of fear and uncertainty, President Nelson teaches us to respond to turmoil with faith. I love the statement, "Strength comes when you remember that you have a divine nature, an inheritance of infinite worth." Regardless what the world throws at us, a person of faith remembers always that he is a child of God bearing those seeds of divinity; and that regardless of what the temporary situation might be, there are promises of an eventual inheritance of unimagined peace and blessings. A disciple who "walk[s] in the Lord's path of righteousness... will be blessed to continue in His goodness" regardless of the surrounding circumstances. Those who begin to understand this alternative to fear and uncertainty are asked to teach and inspire others—particularly children. They need examples around them of individuals who confront challenges with faith and conviction. And we also have the responsibility to be a light to the world. Finally, we should remember that the Priesthood has power to bless and strengthen as we strive to overcome challenges in life. Those blessings can "change the circumstances of your lives" in very real ways!